Home / How Much Does Invisalign Cost in the UK? Invisalign invisible braces have become an increasingly popular cosmetic dental treatment over the past decade or so. They provide a far more stylish and less intrusive alternative to traditional metal braces. The Invisalign cost is less than you might think, and they provide a viable alternative to traditional braces which are not only barely visible, but are hugely effective at straightening teeth. Following your initial consultation, your dentist will also be able to show you the gradual progress of your treatment on a computer. You’ll get to see exactly what your teeth will look like before you even start your treatment. This can be really encouraging to people that there’s a positive ending following the extended treatment – something that’s not generally available to those getting traditional dental treatment. More than 2.5 million people around the world have had the treatment already, with that number growing steadily every month. The treatment uses incremental aligners to adjust the patients teeth to the preferred position. The initial treatment involved a mould being taken of your teeth. This is then used to create a 3D model of your teeth using a computer and Align Technology. Your dentist will provide a treatment plan and the computer will be used to create a retainer for the various stages between your current teeth and the desired outcome. An individual aligner will then be created for each stage of the process. This will help to gradually adjust your smile until it’s exactly the way you and your dentist want it. Invisible braces can help you get the smile you’ve always wanted, without the need for traditional wire braces. Traditional braces can be extremely uncomfortable for some people, and in terms of your physical appearance there’s no contest. The majority of people won’t even be aware that you’re wearing the aligner at all. The Invisalign retainer is also extremely easy to remove. If it causes any difficulties when you’re eating you can simply remove it and put it back in later. This makes it much easier to eat meat and other chewy food, which can often be problematic with wire braces. Dental hygiene is also far easier to maintain. Simply remove the aligner, brush and floss your teeth, rinse with mouthwash and place the aligner back over your teeth. Another benefit of the treatment is that you can start to see the results fairly quickly. Proper alignment of your teeth starts straight away, and you’ll be able to see gradual progress as you move through the various stages. This can provide a great deal of confidence as you move towards your dream smile. Additionally, because the aligner is practically invisible, other people will notice a big difference as you progress. You’ll receive a new custom-made aligner every two weeks or so. As you progress through each aligner you’ll start to notice your teeth gradually changing position towards your desired outcome. The treatment is not particularly painful or uncomfortable, but there may be a slight adjustment period when switching to a new retainer. As with any major cosmetic dental treatment, the cost is a huge consideration. Treatment can often be expensive, particularly when comparing it to the cost of preventative dentistry on the NHS. The best option is to arrange an initial consultation with a provider in your area. Most cosmetic dentists will provide a free initial consultation to give you a rough idea of the time and costs involved. They can also recommend any other potential orthodontic options to you. finance, which is a huge incentive for many patients. Ask your dentist about the potential financing options if you’re concerned about having to pay the full amount upfront. It won’t be the first time they’ve heard the question and they’ll usually have a solution in place. Invisible braces can be used to treat a wide range of conditions, from slight alignment issues to fairly complex cases that will require longer term treatment. The best way to determine the suitability of a treatment for you is to meet with your nearest provider and get their advice. They’ll be able to advice you on suitability, and if there’s any potential complimentary treatments. Who is Eligible for Invisalign Treatment? Most practitioners will be able to treat the majority of adults and adolescents. 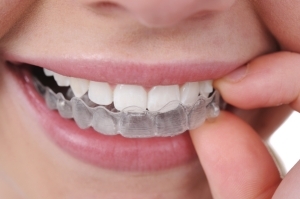 A modified version of the normal mould, called Invisalign Teen, is often used for teenagers. It offers an ideal solution to crooked teeth for notoriously self-conscious teens. As always, the best thing to do is to speak with your dentist to determine the best possible course of treatment. Your initial consultation will help to determine your suitability for the treatment. Some existing treatments can cause a few issues with the realignment of teeth. This means it’s important that a full and thorough assessment is carried out before any treatment takes place. Dental Bridges – These are typically used to link two or more teeth together. This means they can cause some issues with the realignment of teeth. This will be determined on a case by case basis, so ask your dentist what the best option is. Dental Crowns – Crowns are not generally an issue with realignment treatment. Occasionally the composites known as ‘attachments’ are bonded on to teeth and this can cause issues with the treatment. Again, consult your dentist. Veneers – As with implants, veneers should be able to be adjusted as part of the alignment process. Hopefully this will serve as a solid guide to the treatment, and the various aspects such as how much Invisalign costs and what to expect throughout your treatment. If you have any questions please contact us and we’ll try to answer your query.